Oh, Amsterdam. Whether you come for the museums, stroopwafels, or a cheeky peek at the Red Light District, at some point you’ll be wandering along cobbled streets that overlook the iconic canals. Newsflash: those dreamy canals are filled with rubbish. "Plastic soup" is a major global problem, this year only another eight billion kilos of plastic waste will pour into the world’s oceans, lakes and rivers, polluting our natural environment and creating a hazard for wildlife. Litter-picking isn’t a lame school punishment anymore. Keeping the environment clean is cool, and vitally important. Plastic has been destroying our world for years, it's time for revenge. The Ginger and the Vegan wanted to go one step beyond avoiding plastic and proper recycling. We found out it is indeed possible to do more and actively contribute to your carbon footprint reduction. How? You ask? Plastic fishing, baby! 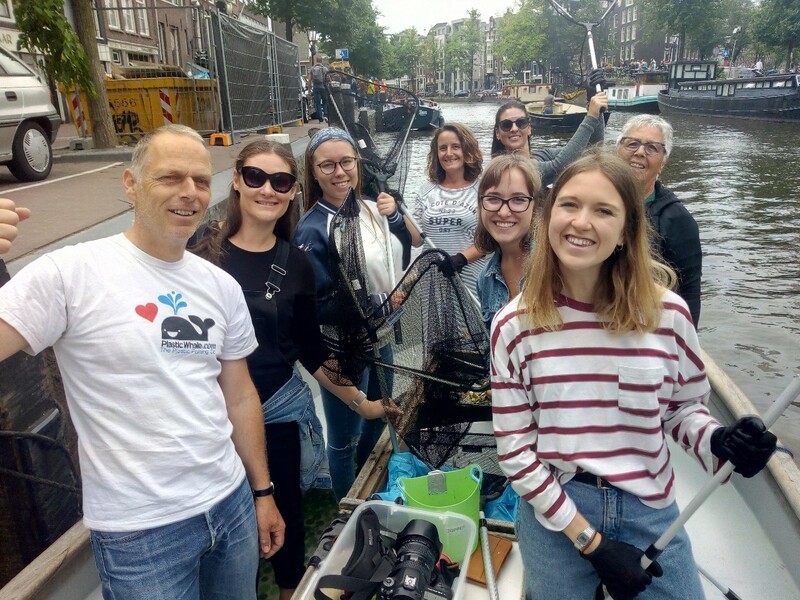 Plastic Whale is a social enterprise who runs plastic fishing cruises along the canals of Amsterdam and Rotterdam, working towards freeing the world’s waters from plastic. 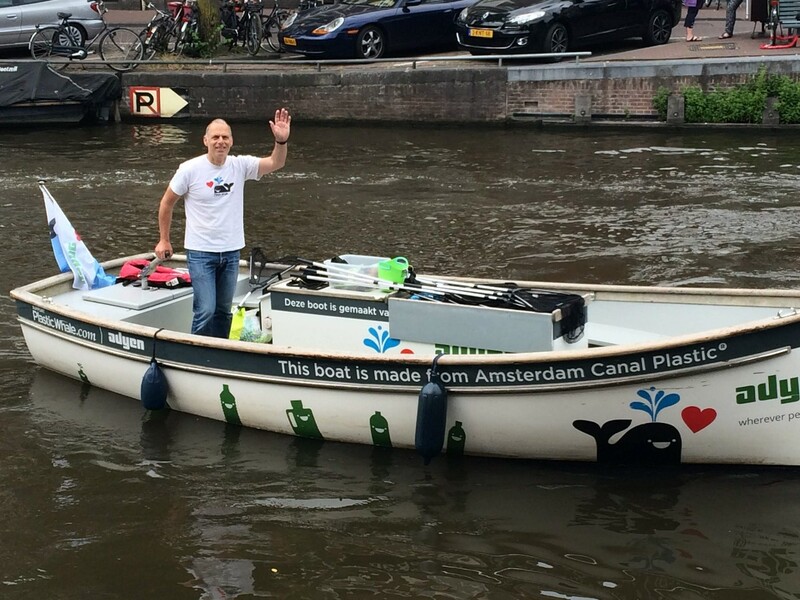 Born in 2011 from a challenge to build a boat made from plastic waste, the company now boasts a fleet of ten boats made from Amsterdam Canal Plastic. They also use the same plastic waste to make a range of high-end office furniture. Morgana and Jas were in awe of their wasteless ways. Overfishing can be a good thing when it’s concerning plastic. Plastic Whale wants to show that plastic isn’t disposable, it’s still valuable as raw material. They want to raise awareness on this zero-waste mindset and their achievements prove that it’s possible to turn the tide against plastic pollution. Keeping the canals looking pretty and saving the environment with a swoop of your fishing net. What’s not to love? Morgana and Jas jumped at the chance to stretch their sea legs and stretch them they did. We had a WHALE of a time (get it?) plastic fishing with a group of like-minded people. The rest of our fishing squad said they too were really into environmentalism and make little changes in their daily lives, like using reusable water bottles. The cruise really combined fun with doing something useful as we all got personally invested in each other’s catches. While we fished out whatever rubbish we saw (Jas found a driver's license), only plastic bottles can be recycled into Plastic Whale’s boats and furniture. So bonus points if you fish one of those. Bottle ahoy! One of our new friends also told us about the Boskalis Beach Cleanup Tour in the Netherlands which Kinder World will be sure to check out in August. Ultimately, the Ginger and the Vegan would 10/10 recommend. Morgana’s even thinking about taking the idea back with her to Birmingham. As she never fails to mention, they have more canals than Venice. Read what Jas and Morgana were up to in the past 22 days.